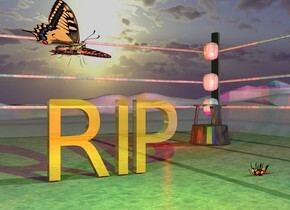 The gold "RIP" is on the [texture] boxing Ring. The very large butterfly is 4 inches above and -20 inches to the left of the "RIP". It is facing southeast. it is leaning to the left. The huge bee is 1 foot in front of and a foot to the right of the "RIP". It is facing left. It is upside down. It is -2 inches above the bottom of the "RIP". The [newspaper] ground. The lime light is above and 2 feet in front of the "RIP". The mauve light is two feet to the left of the lime light. The red light is 3 feet in front of the "RIP". The camera light is black. it is morning. The blue light is 3 feet to the right of the red light. The wood stool is 3 feet to the right and 3 feet behind the "RIP". The second red light is 6 inches to the left of the stool.